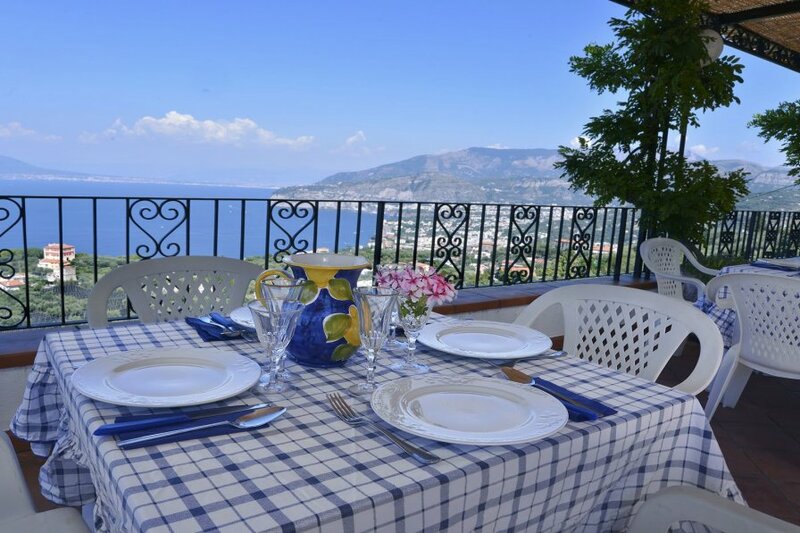 Situated on one of the most panoramic areas of the Sorrento Peninsula, Villa Priora is the top section of a very large villa and enjoys breath taking views of the Gulf of Naples with Mount Vesuvius on the back ground and Sorrento below. It features large terraced, sea view, furnished patios and terraces where you can spend unforgettable days enjoying outdoor meals, bask in the sun by the private swimming pool, a pizza oven and barbecue. For larger groups, there is an independent annex within the villa grounds which consists of 2 en-suite double bedded rooms each with mini fridge, safe, balcony and sea views, this is closed when renting just the Villa Priora and is compulsory in July and August. Please see Villa Priora Grande for full details. Access to Villa Priora is through electric gates off the main road into designated car park (2 cars) and up 50 steps to the second terraced garden which allows entrance into a dining room with open plan kitchen fully equipped with dishwasher, fridge/freezer, kettle, coffee machine, 4 gas burner stove, electric oven. French doors lead to a large furnished terrace with breathtaking sea views. Corridor leads to 3 double bedrooms each with balcony and sea view one with a safe, 2 bathrooms one with shower cubicle and second with bath tub and washing machine. At the end of the corridor there is a lounge with bay windows over the Bay of Naples. This lounge has a double sofa bed and can be suitable for extra two persons. The private swimming pool, measuring 3 m. X 10 m., is reached by climbing 32 steps from the villa, on this level you will find an outdoor shower, a bathroom with wc and wash basin, pizza oven and barbecue. There is also a solarium of about 140 square meters, this is undoubtedly the most beautiful area of the villa where you can spend unforgettable days enjoying the swimming pool, the view of the sea and the Gulf or a pleasant breakfast or dinner. Equipment at the guests disposal: Washing machine, BBQ, satellite TV, air conditioning, central heating in all the rooms, microwave oven, electric oven, dishwasher, hairdryer, iron and ironing board, Wi-Fi internet. This property is available for a minimum stay of seven nights, only from Saturday to Saturday in high and mid season. Service - Beach: 6 Km. (Sorrento Marina Grande) - Restaurants 300 m. - Bus Stop 50 m. - Shops 3,5 Km. - Motorway 31 Km. Cites - S. Agata sui 2 Golfi: 3,5 Km. - Massa Lubrense: 8,5 Km. - Sorrento: 6 Km. - Napoli: 57 Km. - Positano: 18 Km. - Amalfi: 34 Km. - Ravello: 41 Km. - Roma: 276 Km. Attractions - Pompei Excavations: 35 Km. - Vesuvius Crater: 57 Km. - Amalfi Coast: 9 Km. - Paestum Excavations: 108 Km. - Capri Island: connected from the port of Sorrento 6,5 Km. Airports - Naples Capodichino - 68 Km. - Roma Leonardo da Vinci 291 Km. - Roma Ciampino 264 Km. - Bari 299 Km. Railway Stations - Napoli Centrale 57 Km. - Sorrento 6,5 Km. Check-in time is between 3,00 and 8,00 p.m. You will be met and taken to the booked accommodation, asked for a photo copy of your Id or passport, any extras and the Breakage deposit (in cash only in any currencies) € 500,00 – this is refunded on your departure day, less any breakages. Check-out time is between 07:00 a.m. and 10:00 a.m. Arrival and departure times can be arranged outside these times for this service a supplement of € 55,00 is applied. Rental tariff includes consumes of water, bedroom and bathroom linen with weekly changes. Occasionally the owner stays on the lower floors of the villa. Villa Priora is located on highway 145, also called Nastro Verde, halfway between Sorrento and Sant´Agata sui Due Golfi, famous for sweeping panoramas and numerous trekking routes. Located on the Sorrento Peninsula, at the foot of the Lattari Mountains, facing the Bay of Naples and Vesuvius. This place Priora, is the major district of the hills surrounding Sorrento. Nearby Sant´Agata is also renowned for the goodness of local food: the territory is rich in lemon groves, a particular type of lemon called "femminello ovale" is cultivated for its particularly aromatic peel which is used in various ways in local cuisine. A network of paths, stretching for about 100 km runs through Massa Lubrense, the neighbouring Municipalities and the Lattari Mountains overlooking the Amalfi coast, covering the entire area. The larger, and well-known town of Sorrento is just 6,5 Km. away and from here there are ferry boats and hydrofoils to Naples, Capri, Ischia, Amalfi and Positano, as well as various mini-cruises around the coastline. There are several ways to get to Priora / Sorrento from Naples Capodichino Airport or Naples Train station either by renting a car or by public transport. It is also possible to arrange private transfer directly to the your property. Once at the property you can get around fine without the car as parking in the towns is hard to come by and expensive. Public Buses operate year-around connecting Sant´Agata sui due Golfi to Massa Lubrense and Sorrento, where are buses to all the Amalfi Coast villages and Sorrento area. Ferries from Sorrento (from May to October) operate a service between Amalfi - Positano - Capri Island - Naples.